Thaayaar - Kadalmagal Naachiyaar, Sri Boodevi. Theertham - Amrutha Theertham, Thirupaarkadal. Feature This is also called Lord's Vyooha State. This is NOT on BHOOLOKA. The Moolavar of this Thirupathi is Ksheerapthi Nathan. Also named as "Thiruppaarkadal Nathan". He is found on the Aadhiseshan in Sayana - Kidantha thirukkolam facing his thirumugham towards South dorectopm. 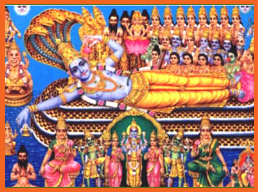 Prathyaksham for Brahma devan, Rudran (Lord Vishnu) and all other Devars and Rishis.